↑ "Jordanian Fighters Protecting Aid Mission". The Jordan Times. 6 April 2011. สืบค้นเมื่อ 6 April 2011. ↑ Staff (25 March 2011). "UAE Updates Support to UN Resolution 1973". WAM (Emirates News Agency). สืบค้นเมื่อ 26 March 2011. ↑ "Libya's Tribal Politics Key to Gaddafi's Fate". Stabroek News. 23 February 2011. สืบค้นเมื่อ 26 July 2011. ↑ BBC News (23 February 2011). Libya: Who is propping up Gaddafi? ↑ "Middle East Unrest – Live Blog". Reuters. ↑ Staff (8 March 2011). "Libya's Opposition Leadership Comes into Focus". Stratfor (via Business Insider). สืบค้นเมื่อ 26 March 2011. ↑ "Rebels Forced from Libyan Oil Port". BBC News. 10 March 2011. Archived from the original on 28 January 2011. ↑ Staff (10 March 2011). "The Battle for Libya: The Colonel Fights Back – Colonel Muammar Qaddafi Is Trying to Tighten His Grip on the West, While the Rebels' Inexperience Leaves Them Vulnerable in the East". The Economist. สืบค้นเมื่อ 26 March 2011. ↑ "In the Arena: Libyan opposition has less than 3,000 fighters". Cnnpressroom.blogs.cnn.com. สืบค้นเมื่อ 2011-08-16. ↑ Staff (23 March 2011). "Libya Live Blog – 24 March". Al Jazeera. Retrieved 26 March 2011. ↑ "Gadhafi Asks Obama To Call Off NATO Military Campaign". via CTV News. 6 April 2011. สืบค้นเมื่อ 14 August 2011. ↑ Staff (10 March 2011). "Libya: How the Opposing Sides Are Armed". BBC News. สืบค้นเมื่อ 14 August 2011. ↑ Carrere, Jean (7 July 2011). "Ajdabiya: A City Under Pressure". rudaw.net. Retrieved 14 August 2011. ↑ Staff (21 June 2011). "Libya Conflict: Nato Loses Drone Helicopter". BBC News. สืบค้นเมื่อ 14 August 2011. ↑ Staff (6 August 2011). "U.S. Navy Drone Missing over Libya Was 'Shot Down' by Gaddafi's Forces". Daily Mail. Retrieved 14 August 2011. ↑ "Libya: Live". The Daily Telegraph. 22 March 2011. ↑ Staff (3 March 2011). "Three Dutch Marines Captured During Rescue in Libya". BBC News. สืบค้นเมื่อ 14 August 2011. ↑ Staff (30 August 2011). "Libya interim leaders give ultimatum to Gaddafi forces". BBC News. สืบค้นเมื่อ 31 August 2011. ↑ Barker, Anne (24 February 2011). "Time Running Out for Cornered Gaddafi". ABC News. สืบค้นเมื่อ 14 August 2011. ↑ Nicholas Casey; José de Córdoba (February 26, 2011). "Where Gadhafi's Name Is Still Gold". The Wall Street Journal. ↑ Kranjc, Svebor (28 February 2011). "Libyan Attacks Could Be Crime Vs Humanity: ICC". Reuters. สืบค้นเมื่อ 26 March 2011. ↑ Wyatt, Edward (February 26, 2011). "Security Council Calls for War Crimes Inquiry in Libya". The New York Times. สืบค้นเมื่อ 27 February 2011. ↑ [ลิงก์เสีย] Staff (17 March 2011). "Security Council Authorizes 'All Necessary Measures' To Protect Civilians in Libya". UN News Centre. สืบค้นเมื่อ 17 March 2011. ↑ Staff (19 March 2011). "Missiles Strike Libya in First Wave of Allied Assault – Gadhafi Vows To Defend Against 'Colonial, Crusader' Aggression". MSNBC. สืบค้นเมื่อ 26 March 2011. ↑ The UN website still refers to Libya by this name; "United Nations Member States". Un.org. สืบค้นเมื่อ 2011-08-20. ↑ Lederer, Edith (16 September 2011). "UN approves Libya seat for former rebels". San Jose Mercury News. สืบค้นเมื่อ 16 September 2011. ↑ "African Union officially recognises Libya's new leadership". ↑ Viscusi, Gregory (23 February 2011). "Qaddafi Is No Mubarak as Regime Overthrow May Trigger a 'Descent to Chaos'". Bloomberg. Archived from the original on 27 February 2011. สืบค้นเมื่อ 12 March 2011. ↑ Staff. "Libya". Country Report. Freedom House. สืบค้นเมื่อ 7 August 2011. ↑ Whitlock, Craig (22 February 2011). "Gaddafi Is Eccentric But the Firm Master of His Regime, Wikileaks Cables Say". The Washington Post. สืบค้นเมื่อ 12 March 2011. ↑ "Gadhafi's Military Muscle Concentrated In Elite Units". NPR. 10 March 2011. สืบค้นเมื่อ 2 July 2011. ↑ "Video Libyan Leader Muammar Gaddafi's Forces Facing Modern Firepower From RAF". Sky News. 18 March 2011. สืบค้นเมื่อ 2 July 2011. ↑ Staff (24 February 2011). "Endgame in Tripoli – The Bloodiest of the North African Rebellions So Far Leaves Hundreds Dead". The Economist. สืบค้นเมื่อ 12 March 2011. ↑ Simons, Geoffrey Leslie (1993). Libya – The Struggle for Survival. St. Martin's Press (New York City). p. 281. ISBN 978-0-312-08997-9. ↑ Silver, Nate (31 January 2011). "Egypt, Oil and Democracy". FiveThirtyEight: Nate Silver's Political Calculus (blog of The New York Times). สืบค้นเมื่อ 12 March 2011. ↑ Ali Alayli, Mohammed (4 December 2005). "Resource Rich Countries and Weak Institutions: The Resource Curse Effect" (PDF). Berkeley University. สืบค้นเมื่อ 22 February 2011. ↑ Solomon, Andrew (21 February 2011). "How Qaddafi Lost Libya". News Desk (blog of The New Yorker). สืบค้นเมื่อ 12 March 2011. ↑ แม่แบบ:Registration required Risen, James; Lichtblau, Eric (9 March 2011). "Hoard of Cash Lets Qaddafi Extend Fight Against Rebels]". The New York Times. สืบค้นเมื่อ 10 March 2011. ↑ 54.0 54.1 Maleki, Ammar (9 February 2011). "Uprisings in the Region and Ignored Indicators". Rooz (via Payvand). สืบค้นเมื่อ 26 March 2011. ↑ Kanbolat, Hasan (22 February 2011). "Educated and Rich Libyans Want Democracy". Today's Zaman. Archived from the original on 27 February 2011. สืบค้นเมื่อ 12 March 2011. ↑ Ward, Olivia (28 February 2011). "Moammar Gadhafi's Hold on Libya Slipping". Toronto Star. สืบค้นเมื่อ 5 August 2011. ↑ Staff (3 March 2011). "A Civil War Beckons – As Muammar Qaddafi Fights Back, Fissures in the Opposition Start To Emerge". The Economist. สืบค้นเมื่อ 12 March 2011. ↑ 59.0 59.1 Staff (24 February 2011). "The Liberated East – Building a New Libya – Around Benghazi, Muammar Qaddafi's Enemies Have Triumphed". The Economist. สืบค้นเมื่อ 12 March 2011. ↑ Staff (2 March 2009). "Libya's Jobless Rate at 20.7 Percent: Report". Reuters. สืบค้นเมื่อ 12 March 2011. ↑ Timpane, John (28 February 2011). "Twitter and Other Services Create Cracks in Gadhafi's Media Fortress". The Philadelphia Inquirer. สืบค้นเมื่อ 3 March 2011. ↑ 62.0 62.1 62.2 62.3 Eljahmi, Mohamed (Winter 2006). "Libya and the U.S.: Qadhafi Unrepentant". Middle East Quarterly (via Middle East Forum). สืบค้นเมื่อ 18 March 2011. ↑ Davis, Brian Lee (1990). Qaddafi, Terrorism, and the Origins of the U.S. Attack on Libya. Praeger Publishing (New York City). ISBN 978-0-275-93302-9. ↑ Staff (24 February 2011). "Building a New Libya – Around Benghazi, Muammar Qaddafi's Enemies Have Triumphed". The Economist. สืบค้นเมื่อ 13 August 2011. ↑ Black, Ian (10 April 2007). "Great Grooves and Good Grammar – After Years When Foreign Language Teaching Was Banned, Libyans Are Now Queuing Up To Learn English". The Guardian. สืบค้นเมื่อ 13 August 2011. ↑ Metz, Helen Chapin (editor) (1987). Libya –A Country Study. Washington, D.C.: US Library of Congress (via countrystudies.us). OCLC 19122696. Retrieved 13 August 2011. ↑ Bright, Martin (28 March 2004). "Gadaffi Still Hunts 'Stray Dogs' in UK – Despite Blair Visit, Dissidents Say $1m Bounty Remains on Head of Dictator's Opponent". The Observer (via The Guardian). สืบค้นเมื่อ 18 March 2011. ↑ Staff (16 January 2011). "Libyans Protest over Delayed Subsidized Housing Units". Almasry Alyoum. สืบค้นเมื่อ 18 March 2011. ↑ Abdel-Baky, Mohamed (16 January 2011). "Libya Protest over Housing Enters Its Third Day – Frustrations over Corruption and Incompetence in Government Housing Schemes for Poor Families Spills over into Protests across the Country". Al-Ahram (via mesop.de). สืบค้นเมื่อ 18 March 2011. ↑ Staff (4 February 2011). "Watchdog Urges Libya To Stop Blocking Websites". Agence France-Presse (via Google News). สืบค้นเมื่อ 18 March 2011. ↑ Staff (27 January 2011). "Libya Sets Up $24 Bln Fund for Housing". Reuters. สืบค้นเมื่อ 18 March 2011. ↑ Edwards, William (16 February 2011). "Violent Protests Rock Libyan City of Benghazi". France 24. สืบค้นเมื่อ 26 March 2011. ↑ 78.0 78.1 78.2 Mahmoud, Khaled (9 February 2011). "Gaddafi Ready for Libya's 'Day of Rage'". Asharq Al-Awsat. Archived from the original on 10 February 2011. สืบค้นเมื่อ 10 February 2011. ↑ Debono, James. "Libyan Opposition Declares 'Day of Rage' Against Gaddafi". Malta Today. Archived from the original on 10 February 2011. สืบค้นเมื่อ 10 February 2011. ↑ Staff (17 February 2011). "Anti-Government Protesters Killed in Libyan Clash". Associated Press (via USA Today). สืบค้นเมื่อ 12 August 2011. ↑ Gillis, Clare Morgana (4 March 2011). "In Eastern Libya, Defectors and Volunteers Build Rebel Army". The Atlantic. สืบค้นเมื่อ 12 March 2011. ↑ Golovnina, Maria (28 February 2011). "World Raises Pressure on Gaddafi". National Post. สืบค้นเมื่อ 13 March 2011. ↑ Staff (27 February 2011). "Libya Opposition Launches Council – Protesters in Benghazi Form a National Council 'To Give the Revolution a Face'". Al Jazeera. สืบค้นเมื่อ 13 March 2011. ↑ Sengupta, Kim (11 March 2011). "Why Won't You Help, Libyan Rebels Ask West". The New Zealand Herald. สืบค้นเมื่อ 13 March 2011. ↑ Staff (27 February 2011). "Libyan Ex-Minister Wants Election". Sky News Business Channel. สืบค้นเมื่อ 13 March 2011. ↑ Staff (25 February 2011). "New Media Emerge in 'Liberated' Libya". BBC News. สืบค้นเมื่อ 13 March 2011. ↑ Staff (1 March 2011). "Evidence of Libya Torture Emerges – As the Opposition Roots Through Prisons, Fresh Evidence Emerges of the Government's Use of Torture". Al Jazeera. สืบค้นเมื่อ 13 March 2011. ↑ "Libya's ragtag rebels". สืบค้นเมื่อ 30 March 2011. ↑ Garcia-Navarro, Lourdes. "As Tide Turns, Rebels' Dream Of 'Free Libya' Dims". NPR. สืบค้นเมื่อ 30 March 2011. ↑ Golovnina, Maria. "Upbeat Gaddafi fires trademark blast at West and Qaeda". Reuters. สืบค้นเมื่อ 30 March 2011. ↑ John Simpson (29 March 2011). "Halt To Rebel Advance Creates Libyan Divide". BBC News. สืบค้นเมื่อ 30 March 2010. ↑ Gillis, Clare Morgana (29 March 2011). "Libyan Rebels: 'We're Not al-Qaeda'". USA Today. สืบค้นเมื่อ 30 March 2010. ↑ "Two Policemen Hanged in Libya Protests". Xinhua News Agency. 19 February 2011. สืบค้นเมื่อ 6 June 2011. ↑ Beech, Hannah. "Libya's Alleged Foreign Mercenaries: More Gaddafi Victims?". Time. สืบค้นเมื่อ 6 June 2011. ↑ "Libya: Inside a Benghazi Court with Gaddafi's Mercenaries". Daily Mail. ↑ Schemm, Paul (25 February 2011). "Battle at Army Base Broke Gadhafi Hold in Benghazi". The Washington Post. ↑ Staff (24 February 2011). "Muammar Gaddafi Ordered Lockerbie Bombing, Says Libyan Minister". News Limited. สืบค้นเมื่อ 17 March 2011. – citing an original interview with Expressen in Sweden: Julander, Oscar; Hamadé, Kassem (23 February 2011). "Khadaffi gav order om Lockerbie-attentatet". Expressen (in Swedish). สืบค้นเมื่อ 17 March 2011. Unknown parameter |trans_title= ignored (help)CS1 maint: Multiple names: authors list (link) CS1 maint: Unrecognized language (link) English translation (via Google Translate). ↑ 102.0 102.1 102.2 Staff (23 February 2011). "Pressure Mounts on Isolated Gaddafi". BBC News. สืบค้นเมื่อ 18 March 2011. ↑ Staff (24 February 2011). "Gaddafi Loses More Libyan Cities – Protesters Wrest Control of More Cities as Unrest Sweeps African Nation Despite Muammar Gaddafi's Threat of Crackdown". Al Jazeera English. สืบค้นเมื่อ 17 March 2011. ↑ Staff (23 February 2011). "Protesters Defy Gaddafi as International Pressure Mounts (1st Lead)". Deutsche Presse-Agentur (via Monsters and Critics). สืบค้นเมื่อ 17 March 2011. ↑ Staff (23 February 2011). "Middle Eastern Media See End of Gaddafi". BBC News. สืบค้นเมื่อ 17 March 2011. ↑ Staff (23 February 2011). "Gaddafi Defiant as State Teeters – Libyan Leader Vows To 'Fight On' as His Government Loses Control of Key Parts in the Country and as Top Officials Quit". Al Jazeera English. สืบค้นเมื่อ 19 March 2011. ↑ "Middle East and North Africa Unrest". BBC News. 24 February 2011. Archived from the original on 28 January 2011. สืบค้นเมื่อ 24 February 2011. ↑ "Gadhafi To Fight to 'The Last Bullet'". MSNBC. 7 February 2011. สืบค้นเมื่อ 2 July 2011. ↑ "Fierce Battles Erupt Across Libya". ABC News. สืบค้นเมื่อ 6 June 2011. ↑ Staff (16 March 2011). "Civil War in Libya". CNN. Retrieved 19 March 2011. ↑ Staff (7 March 2011). "Libya: 21 Killed in Misrata Weekend Fighting – Twenty-One People, Including a Child, Were Killed and Dozens Wounded in Libya's rebel-Held City of Misrata During Fighting and Shelling by Muammar Gaddafi's Forces on Sunday, a Doctor Has Claimed". The Daily Telegraph. Retrieved 11 August 2011. ↑ Staff (10 March 2011). "Libya's Zawiyah Back under Kadhafi Control: Witness". Agence France-Presse (via Google News). สืบค้นเมื่อ 11 August 2011. ↑ Staff (11 March 2011). "Gaddafi Loyalists Launch Offensive – Rebel Fighters Hold Only Isolated Pockets of Oil Town after Forces Loyal to Libyan Leader Attack by Air, Land and Sea". Al Jazeera English. สืบค้นเมื่อ 11 August 2011. ↑ Staff (13 March 2011). "Libyan Troops Defect Near Rebel-Held Misrata-Rebel". Reuters (via AlertNet). สืบค้นเมื่อ 11 August 2011. ↑ [ลิงก์เสีย] "Breaking News and Conservative Opinion on Politics". townhall.com. สืบค้นเมื่อ 6 June 2011. ↑ Hauslohner, Abigail (15 March 2011). "Rumors from an Encircled Town: The Fate of Ajdabiyah". Time. สืบค้นเมื่อ 11 August 2011. ↑ Staff (16 March 2011). "Rebel Fighter Jets 'Sink Gaddafi Warships'". NewsCore (via Herald Sun). สืบค้นเมื่อ 11 August 2011. ↑ Hussein, Sara (18 March 2011). "UN Backs Libya Air Strikes, Kadhafi Defiant". The Sydney Morning Herald. สืบค้นเมื่อ 11 August 2011. ↑ Staff (18 March 2011). "Libya: UN Backs Action Against Colonel Gaddafi". BBC News. Retrieved 18 March 2011. ↑ Staff (18 March 2011). "Libya Declares Ceasefire But Fighting Goes On". Al Jazeera English. สืบค้นเมื่อ 18 March 2011. ↑ Staff (19 March 2011). "Libya: Gaddafi Forces Attacking Rebel-Held Benghazi". BBC News. สืบค้นเมื่อ 19 March 2011. ↑ Staff (19 March 2011). "Gaddafi Forces Encroaching on Benghazi – Libyan Leader's Army Assault Rebel Stronghold as French Warplanes Conduct Reconnaissance Overflights Across Country". Al Jazeera English. Retrieved 27 March 2011. ↑ Rayment, Sean (19 March 2011). "Libya: Moment a Rebel Jet Crashed to Earth in Flames – Plummeting to Earth in Flames, This Is the Dramatic Moment When a Rebel Libyan Fighter Jet Was Apparently Brought Down over Benghaz". The Daily Telegraph. สืบค้นเมื่อ 27 March 2011. ↑ Staff (19 March 2011). "Fighter Plane Shot Down in Libya's Benghazi: Al-Jazeera". Xinhua News Agency. สืบค้นเมื่อ 11 August 2011. ↑ "Libya Live Blog – March 19". Al Jazeera. สืบค้นเมื่อ 6 June 2011. ↑ "Libya Denies Cutting Off Supplies to Misrata". Reuters. 24 March 2011. Retrieved 1 May 2011. ↑ Staff (27 March 2011). "Gunfire, Explosions Heard in Tripoli". CNN. Archived from the original on 19 March 2011. สืบค้นเมื่อ 19 March 2011. ↑ Freeman, Colin (19 March 2011). "Libya: British Forces Fire Missiles at Gaddafi". The Daily Telegraph. สืบค้นเมื่อ 31 March 2011. ↑ Shrivastava, Sanskar (20 March 2011). "US Launches Missile Strike in Libya". The World Reporter. สืบค้นเมื่อ 27 March 2011. ↑ Staff (19 March 2011). "Crisis in Libya: U.S. Bombs Gaddafi's Airfields". CBS News. สืบค้นเมื่อ 27 March 2011. ↑ Staff (20 March 2011). "Libya: French Jets Resume Sorties as Coalition Builds". BBC News. สืบค้นเมื่อ 27 March 2011. ↑ Staff (20 March 2011). "Explosions, Gunfire Heard in Tripoli as U.S. and Allies Continue Military Strikes". Fox News. สืบค้นเมื่อ 27 March 2011. ↑ Staff (20 March 2011). "British Jets Fired on Libyan Targets". Deutsche Presse-Agentur (via Monsters and Critics). สืบค้นเมื่อ 27 March 2011. ↑ "Libya Live Blog: Coalition Confirms Strike on Gadhafi Compound". CNN. ↑ Transcript. "DOD News Briefing with Vice Adm. Gortney from the Pentagon on Libya Operation Odyssey Dawn". US Defense Department. สืบค้นเมื่อ 6 June 2011. ↑ Hilsum, Lindsay (22 March 2011). "Six Libyan Villagers Shot by US Team Rescuing Pilot – Exclusive: Six Villagers in a Field on the Outskirts of Benghazi Were Shot and Injured When a US Helicopter Landed To Rescue a Crew Member from the Crashed Jet, Reports Lindsey Hilsum". Channel 4 News. Retrieved 27 March 2011. ↑ "Gaddafi's Air Force 'Destroyed' by Coalition". The Independent. 23 March 2011. สืบค้นเมื่อ July 7, 2011. ↑ Staff (23 March 2011). "Canadian Jets Bomb Libyan Target – Clashes Continue Between Rebels, Gadhafi Loyalists in Several Cities". CBC News. สืบค้นเมื่อ 11 August 2011. ↑ "British Submarine Launches Further Strikes on Libyan Air Defence Systems". UK Ministry of Defence. 20 February 2007. สืบค้นเมื่อ 6 June 2011. ↑ Staff (25 March 2011). "Libya: Nato To Take Command of Libya No-Fly Zone". BBC News. สืบค้นเมื่อ 27 March 2011. ↑ "RAF Tornados Strike Libyan Tank Targets". BBC News. 25 March 2011. ↑ "Mid-East Crisis As It Happened: 25 March". BBC News. 25 March 2011. สืบค้นเมื่อ 6 June 2011. ↑ "Tripoli Air Strikes Killed 40 Civilians Claims Vatican Official". The Guardian. 30 March 2011. ↑ "Update on CF Operations in Libya"[ลิงก์เสีย]. Canadian National Defence Department 25 March 2011. Retrieved 1 May 2011. ↑ "Libyan Rebels Advance on Gadhafi's Hometown". CBC News. 28 March 2011. ↑ Jamison, Jane. (29 March 2011) "U.S.S. Barry Takes out Libyan Coast Guard Boat Near Misrata". Uncoverage.net. Retrieved 1 May 2011. ↑ "US Gunships Blast Gaddafi's Troops". ABC News. 29 March 2011. สืบค้นเมื่อ 6 June 2011. ↑ "Air Raids Force Gaddafi Retreat: Rebels Seize the East". The Huffington Post. สืบค้นเมื่อ 6 June 2011. ↑ "Wrapup 2-Libya Says NATO Air Strike Hits Major Oil field". Reuters. 6 April 2011. ↑ "Rebels Say Gaddafi, Not British, Attacked Oilfield". Reuters. 7 April 2011. ↑ "Libya: US Confirms First Predator Strike". BBC News. 23 April 2011. ↑ Brunnstrom, David (4 May 2011). "NATO Chief: Gaddafi's Forces Have Been Weakened". Reuters. ↑ Pawlak, Justyna. "Strikes Destroy 30 Percent of Libya Military Power: NATO". Reuters. สืบค้นเมื่อ 2 July 2011. ↑ "NATO Grounding Qaddafi and Rebel Air Forces". CBS News. 10 April 2011. ↑ "Libya: Fierce Battle for Second Day in Ajdabiya". BBC News. 10 April 2011. ↑ "The Libyan War of 2011". Stratfor. สืบค้นเมื่อ 6 June 2011. ↑ Abrams, Elliott. "A Formula for Libya Unworthy of Our Country". Weekly Standard (via Council on Foreign Relations). สืบค้นเมื่อ 6 June 2011. ↑ Black, Ian (14 April 2011). "Libyan Rebels Receiving Anti-Tank Weapons from Qatar – Officials in Doha Confirm Qatar Has Been Secretly Supplying French-Made Missiles to Libyan Rebel Stronghold of Benghazi". The Guardian. สืบค้นเมื่อ 8 August 2011. 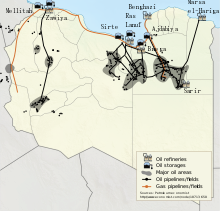 ↑ "Libyan Rebels 'Sign Oil Export Deal with Qatar'". BBC News. 27 March 2011. ↑ "Turkey Sets Up $100 Mln Fund To Help Libya Rebels". Reuters. 9 February 2009. สืบค้นเมื่อ 10 June 2011. ↑ "Libyan Rebels Blame West for Lack of Cash". Reuters (via Times Colonist). 19 June 2011. สืบค้นเมื่อ 2 July 2011. ↑ "France Gives Libya Rebels Arms but Britain Balks". Pakistan Observer. สืบค้นเมื่อ 2 July 2011. ↑ Birnbaum, Michael (14 September 2010). "France Sent Arms to Libyan Rebels". The Denver Post. สืบค้นเมื่อ 2 July 2011. ↑ "Libya Conflict: France Air-Dropped Arms to Rebels". BBC News. 4 June 2011. สืบค้นเมื่อ 2 July 2011. Libya remembers - ongoing list of deaths. หน้านี้แก้ไขล่าสุดเมื่อวันที่ 9 ธันวาคม 2561 เวลา 14:53 น.